Sreemongal Pourashava is located in the south-eastern corner of Moulvibazar district, the largest urban area in the Sreemongal Upazila. Sreemongal Pourashava is situated at 240 18’ N latitude and 910 43’ 30” E longitudes. It is situated at the heart of Balishira Valley, full of tea gardens. Sreemongal is surrounded by Ashidron Union on the south and south-western side, Dasher bazar on the east and by Sreemongal Union on the north. Map: Location Map of Sreemangal Pourashava and Its extended area. Map: Base Map of Sreemangal Pourashava. Land-use planning is the term used for a branch of public policy encompassing various disciplines which seek to order and regulate land use in an efficient and ethical way, thus preventing land-use conflicts. Governments use land-use planning to manage the development of land within their jurisdictions. In doing so, the governmental unit can plan for the needs of the community while safeguarding natural resources. To this end, it is the systematic assessment of land and water potential, alternatives for land use, and economic and social conditions in order to select and adopts the best land-use options. The land uses of the in the Pourashava area are shown in Table 1. In the land use pattern of the Pourashava, 17 types of land uses are found. It is clearly evident from the table that residential land use ( 60.65%) dominates the Pourashava area, followed by tea garden (6.62%), commercial (more than 6%), road network and transport and communication (5.89%), agricultural (about 5%) and government services and educational land use occupy only 2.9 percent of land. Sreemongal Pourashava has followed major development along the major roads of the Pourashava. Though the economic backbone of the Pourashava is tea industry, the project area’s land use is dominated by residential area. Table: Existing Land Use Classification of Sreemongal Pourashava and Its extended area. Residential land has occupied about 727.73 acres of land that is 59.52% of the total Pourashava area. The survey result indicated that residential category is the 1st dominating land use in the project area. Commercial area occupies only 73.901 acres of land consisting 6.04% of the Pourashava area. Major land uses under this category are retail shops/stores and wholesale shopping areas, financial institution like bank, insurance etc, hotel and restaurant and all categories of ribbon commercial developments along the major roads.The extent of commercial land use depends on the size of consumers. 53.78%of the commercial land has been found in this area. Industrial area occupies only 0.75 acres of land consisting 0.03% of the total Pourashava area. Major industrial and manufacturing activity covering land are found in ward no. 4 that is 0.45 acre. Other industrial activities are agglomerated in ward no. 9 occupied about .30 acre, 0.15 acre and 0.76 acre respectively. Industrial use comprises mainly rice mill, saw mill, factory etc. 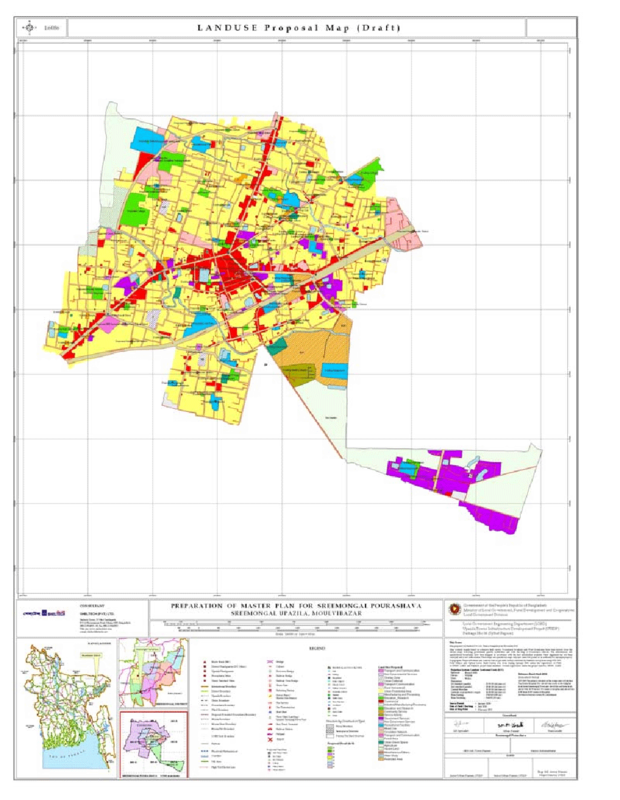 Map: Existing Land Use Map of Sreemangal Pourashava and Its extended area. The Agriculture is 2nd dominant type of land use in the Pourashava as well as the extended area. Approximately 152.91 acres or about 12.51% of land belong to this use. This segment of land use is maximum in ward no. 01 covering 99.71 acres that is 65.23% of the total Pourashava. This category includes paddy field, cropland, grazing land, horticulture, dairy farm, poultry farm, fish farm, nursery, bamboo garden etc. Only 1.45% of total land is used in educational use in Sreemongal. It occupies about 9.57 acre of land (1.47%). Other Wards have some educational land uses, whereas Ward no. 02 is totally devoid of educational land use. The Government service pattern covers mainly 23.50 acres comprising only 1.92% of the total Pourashava area. The highly covered area is ward no. 01 which constitutes 8.96 acres of the total uses. In only ward no. 02, this kind of land use is negligible covering only 0 acre. Except ward no. 02 in all wards this land use is noticeable. Existing land owned by the Pourashava is 2.4 acres. Among these, almost 1.44 acres of land is used for the construction of Pourashava office in ward no. 06. This land is used as dumping station of the Pourashava. Total land under different government organizations is 232.54 acres. Among these, the highest amount of land exists under Bangladesh Tea Research Institute, it is 145.72 acres. Table 4.2 shows the details. Table: Land under other Govt. Institutes. Within the Pourashava, there are some khas lands as shown in Table 4.3. These lands will be earmarked in the Draft Plan for important uses as per the requirement in the Final Plan. Table: Khas Land in Sreemongal Pourashava and Its extended area. There is about 5 acres of enemy property (vested property) at Sreemongal Pourashava. Circulation network means the communication route of an area. It plays an important role for development of certain area. Only 6.14 percent (75.12 acers) land of Sreemongal Pourashava is used for this purpose. The other wards cover equal distribution of this land use. The lowest amount of land for circulation network is in Ward no. 02 (2.42 acres) compared to the other wards. According to the Pourashava source, the total length of roads in the Pourashava area is 75.12 acers. There are Katcha, semi-pucca and pucca roads within the Pourashava area. There is no waterway communication system at Sreemongal Pourashava. Sreemongal Pourashava has one railway station. This railway network connects Sreemongal Pourashava with Dhaka, Chittagong, Sylhet and other important urban center. There are no airway services for the Pourashava. There is about 10.76 acres of land for community use, which is only 0.88 percent of total land of the Pourashava. There is acute shortage of recreational land use at Sreemongal Pourashava. It reveals that total land for recreational use at Sreemongal Pourashava is only 11.24 acres and these are located in Ward no. 01, 03, 06 and 09. The highest quantity of recreational land is in Ward no. 09 (4.07acre). Ward no. 02, 04, 05, 07, 08 have no recreational land uses. In other remaining Wards, only a little amount of land is used for recreational purposes. Water body is another dominating Land use of the project area. Water body is the third largest Land use of the project area. These land use spread all over the project area. Water bodies like canal, tanks, ponds, ditch etc. encompass only 50.34 acres which is about 4.12% of the Pourashava area. This land use is very less compared to the other land uses within the Pourashava. In urban green category includes the Graveyard/Cremation Ground/Cemetery/Mazar and historic places. Only 0.70 percent of the total land is found as green space. Vacant places within the Pourashava can be used for future development. Within Sreemongal Pourashava, there is a total of about 28.27 acres of vacant land. The highest amount of vacant land is in Ward no. 01 (5.79 acres) and a very negligible amount of land is left vacant in Ward no. 06, 09 and 02. Land of service activity within a Pourashava provides different essential services need for the inhabitants of a specific Pourashava and its surrounding area. The scenario of land for public facilities at Sreemongal Pourashava is very miserable. Total land for service activity at Sreemongal Pourashava is 6.39 acres. BDR camp of Sreemongal Pourashava is located at ward no. 01, which is demarcated as restricted area. Also Office of RAB and police station is also marked as restricted area. All includes total 28.11 acre of restricted area in Sreemongal Pourashava. Most of the NGO offices and services exist in ward nos. 03, 05 and 09. A total of 0.35acres of land is used for this purpose. The highest NGO services exist at ward no. 03. The land of the Pourashava has both official and market values. Both values have impacts on planning and development and therefore in the allocation of lands for different uses. There is probably no fixed official value of lands in the Pourashava. The land register office, however, may have some rates for land transfer (selling and buying). But assessment of land value will be critical for the preparation and implementation of Master Plan. As a result, information on land value has to be used. The value of land varies across different Wards of the Pourashava. The value of high lands is very high in some Wards than others. The details of land value are given in Table. 4.4. The highest land value at Sreemongal Pourashava was found in ward nos. 03, 05, 08 and 09. Here average per decimal land value is Tk.10, 00,000, and the lowest per decimal land value was found in Ward no. 01 (Tk.10, 000/ decimal). Source: Socio-economic Survey (UTIDP, LGED), 2011. Land ownership of Sreemongal Pourashava is broadly divided into public and private lands. Private land covers almost 69.456% (851.564acres) of land and public land covers almost 30.544% (374.486 acres). 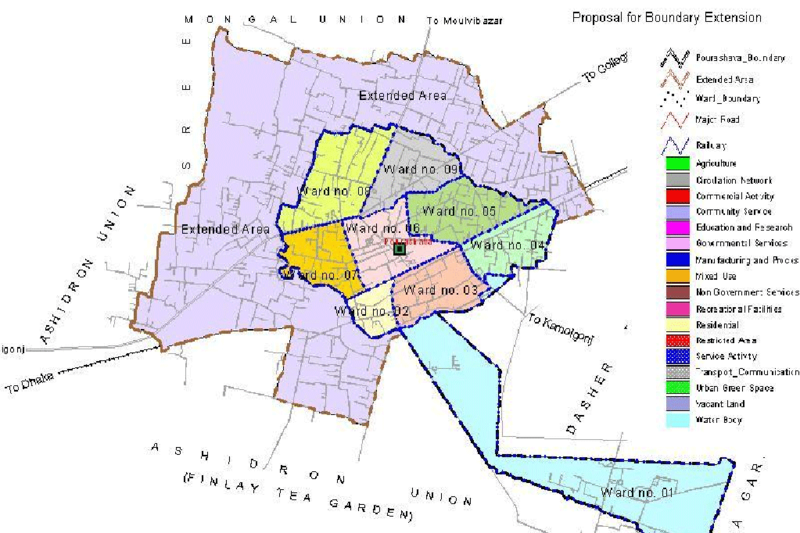 Total amount of Khas land in Sreemongal Pourashava is 50.947 acres (13.67%). The following Table shows the details. Source: Physical Feature Survey and Pourashava (UTIDP, LGED), 2011. 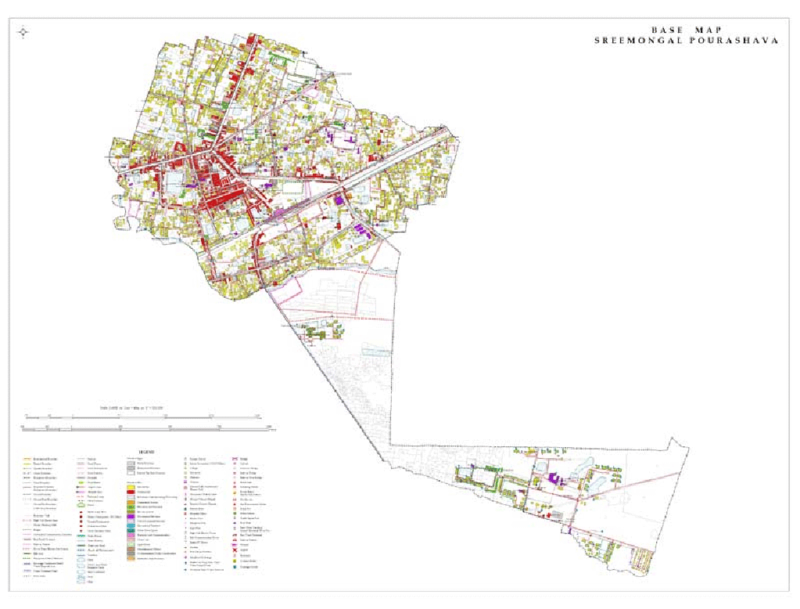 - Delineation of future land use of the town in the land use plan. Some parts of the Pourashava remain under water during the rainy season, and about 4.14% of the land of the Pourashava is water bodies. Projected land use is a critical component to a comprehensive plan. The forecast determines the amount of land needed to accommodate future growth, and includes the land required for residential, commercial and industrial uses. In some instances, a community may have enough vacant lands within its boundary to accommodate its forecasted population increases and land use demands. In other instances, there may be a need to consider land outside a community’s boundaries to accommodate this increase. Table: Proposed Land Use Category for Sreemangal Pourashava and Its extended area. 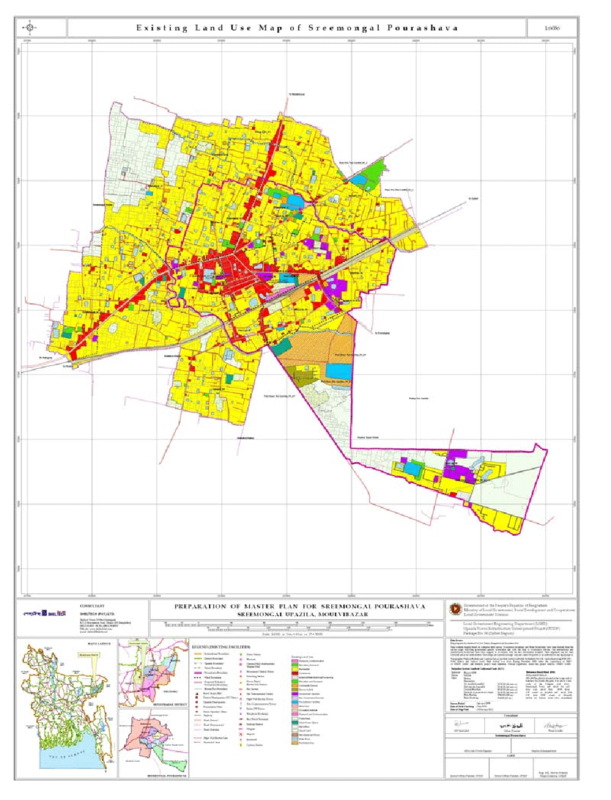 Plan: Proposed Land Use Plan of Sreemangal Pourashava and Its extended area. By maintaining the standard provision of land uses, the boundary of sreemangal pourashava will be extended. The present haphazard development has to be brought under development control. It is expected that with rational allocation and appropriate distribution of land for each category of land use within the Pourashava and its extended area, a balanced and sustainable environment for future development will be achieved.